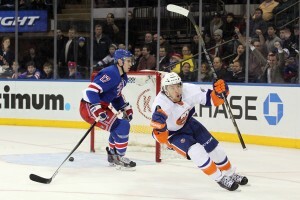 Grabner Scores, Isles Win. No Questions Asked. It’s no surprise that the New York Islanders have been a disappointment to their fans thus far this season. After 38 games, they find themselves in last place of the Metropolitan Division and will most likely finish the month of December without their best player, John Tavares. But there’s one player who means a lot to the Isles organization, and many don’t realize just how valuable he is. This player is Michael Grabner. Grabner was drafted into the NHL in 2006 by the Vancouver Canucks. He made his NHL debut in 2009 with Vancouver and was traded the following summer to the Florida Panthers. After he failed to make the roster in Florida, he was placed on waivers and was claimed by the Isles and became an immediate asset to his new team. He continued to make a name for himself at the 2011 All Star Weekend where he won the Fastest Skater Competition. Grabner continued playing well throughout the remainder of the season and led all NHL rookies, as well as the Islanders, in goals scored with 34. Grabner received a nomination for the Calder Trophy, which is awarded to the NHL’s top Rookie. The Islanders rewarded his standout rookie performance with a 5yr, $15 million contract. But since his rookie year with the Isles, he’s failed to produce at projected levels. He scored 20 less points in his second season with the Isles than he did in his first, and saw his plus/minus go from +13 in 2010/11 to -18 in 2011/2012. In last years shortened season, he produced 16 goals in 45 games and played well. But the scoring in 2013 has been hard to come by for Grabner. The Islanders began the 2013/14 season with a 3-2-2 record and Grabner 8 points. Grabner then went 24 games without a point. During his slump, the Isles won just 5 games and fans watched as their Long Island hockey team fell to the bottom of the Metro division. But all bad things come to an end, yes? Yes. Grabner got himself on the stat sheet with an assist against the Tampa Bay Lightning and then scored two goals the very next game vs. the cross town rival Rangers. He then gave Isles fans an early Christmas present and sealed the deal with an empty netter against the Detroit Red Wings. When you look into the stats, it’s remarkable the impact that Grabner has on the Isles when he scores. The Islanders have yet to lose a game this season when Grabner scores a goal. And they are 5-1-1 when Grabner scores a point. You quickly begin to see how important Grabner is to the Isles in order for them to be successful. During the shortened season in 2012/13, the same pattern’s existed. In games that Grabner scored a goal, the Islanders were 12-1-1. That’s 25 team points when Grabner puts a puck in the net. So in the last year, the Isles are 17-2-2 when Grabner scores a goal. When he doesn’t score a goal, their record is not so glamourous. The Islanders are not out of playoff contention. They are only nine points out of 3rd place in the Metro division, and they still have more than half a season left to play. But if they Isles want to win, Michael Grabner MUST play well and must score points; numbers never lie and it is obvious that the Isles are a much better team when Grabner is scoring goals. And he is more than capable to do so.